Print images and documents to Samsung printers and other compatible printers (not included). 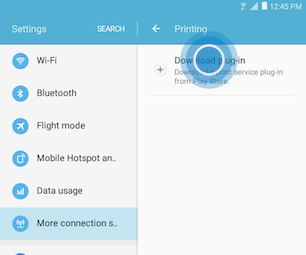 The print function, available as a menu option within some applications, lets you print directly from your device to a printer on the same Wi-Fi network. Your tablet can only print documents on a Wi-Fi printer (wireless). If you need a cable to print a document from your computer, it means that your printer is not a Wi-Fi printer. Also, and this is important, both devices need to be connected to the same network. Screens and settings available may vary depending on your Canadian wireless service provider and your software version. The following steps need to be performed only the first time you want to print a document from your tablet. 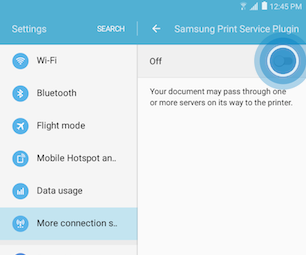 Once your tablet is connected to your printer, the setting will be saved. 1 From a Home screen, touch Apps > Settings. 2 Touch More connection settings > Printing. 4 Swipe from bottom to top, to access all available apps. Then, choose the manufacturer of your printer. 6 Once process is complete. Double-touch Back to return to the Printing menu. 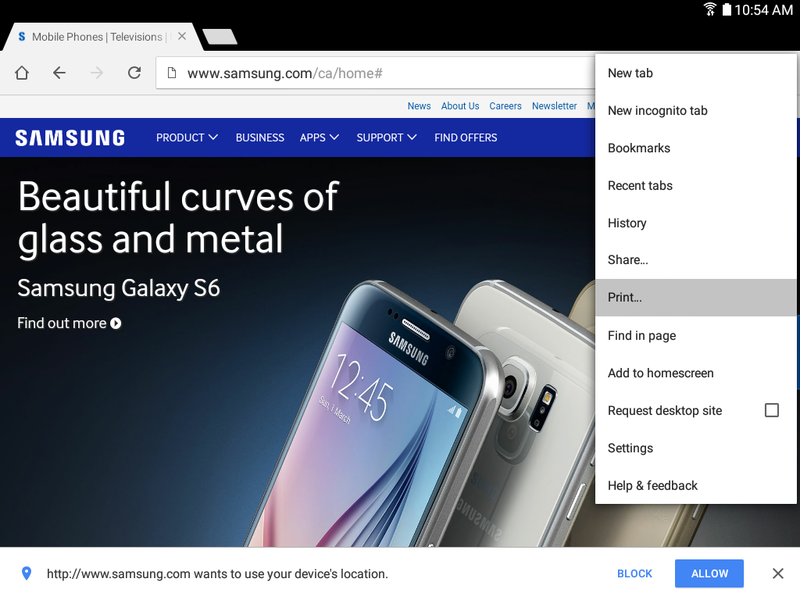 7 Touch the plugin you just downoloaded. 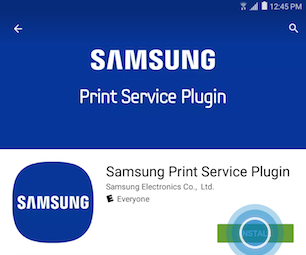 For this example, we selected Samsung Print Service Plugin. 8 Touch the slider to turn on the plugin. 9 If the procedure succeeded, your printer should be listed. If it is not the case, repeat the steps above. If you can’t see your printer in the list, then you need to read the printer’s manual or contact its manufacturer. The above steps need to be performed only the first time you want to print a document from your tablet. 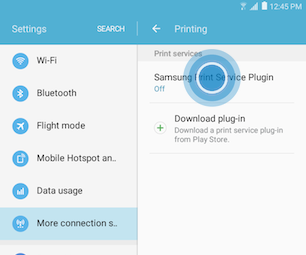 Once your tablet is connected to your printer, the setting will be saved. 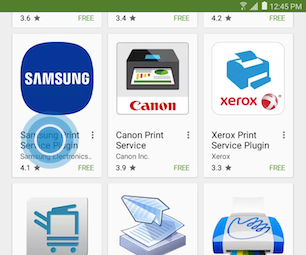 1 From a compatible app such as the Chrome, select an image and touch More Options > PRINT. 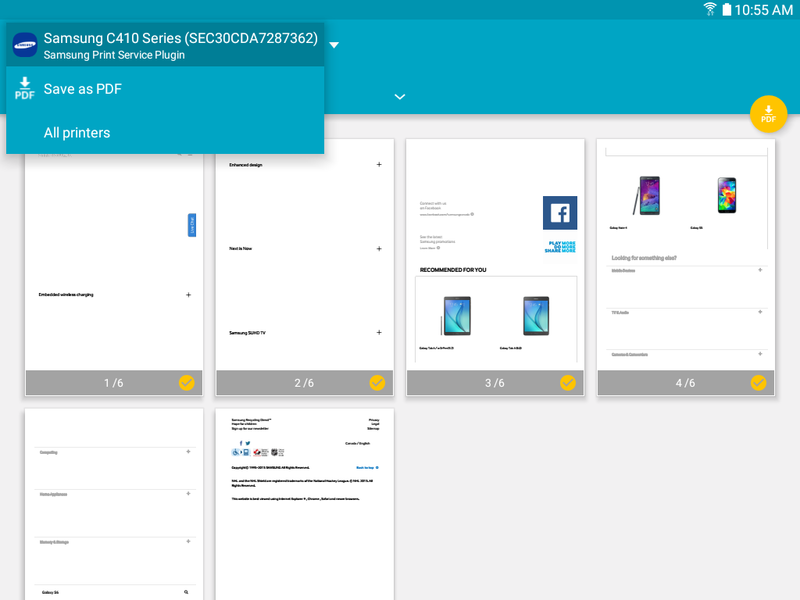 2 The default is set to Save as PDF, change it to the available printer on the device then touch the yellow printing icon (on the right).